SB-6000 Wet Look Sealer seals the pavement surface and brightens and enhances the natural colors of the pavingstone with a luxurious, wet look. It is breathable and will not trap the naturally occurring efflorescence, allowing it to be applied immediately after pavingstones are installed (as well as decreasing freeze-thaw damage). The product improves surface durability, enhancing the colors of the pavement and protecting the surface from salt, acid and staining. 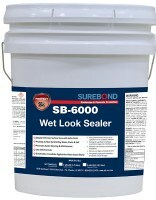 SB-6000 Wet Look Sealer is a water-based, exterior quality urethane surface sealer. It is solvent-free and exceeds all VOC, EPA, OSHA and FDA standards. 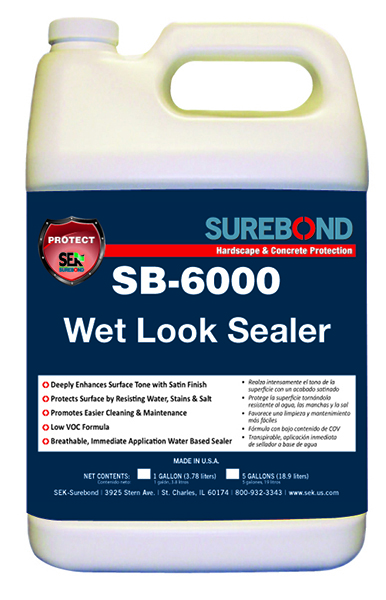 SB-6000 Wet Look Sealer has the consistency of water and is milky white when applied; it dries to a clear, wet look on the surface of the pavement. SB-6000 Wet Look Sealer can be used both inside and outside on old and new pavements. Cured sealer is freeze resistant to -60°F (-51°C) and is stable up to a temperature of 180°F (82°C). The pavement surface should be clean and free from oil, dust and any loose material. If necessary, use SB-442 General Stain Remover to clean pavers (refer to label and data sheet for guidelines). Excess joint sand should be brushed from the surface and the paver joints should be completely filled with dry, correctly graded jointing sand, with the top level not exceeding the bottom of the chamfer or 1/8” below the surface of non-beveled or tumbled paver surfaces. A leaf blower is the recommended method to remove dust and fine particles from the surface to achieve the optimum joint sand height. Remove all efflorescence prior to sealer application. Use SB-488 Efflorescence and Rust Remover if necessary (refer to label and data sheet for guidelines). The surface should be dry prior to application. Previously applied sealer should be stripped. If any product separation should occur, gently agitate container to re-emulsify mixture. SB-6000 Wet Look Sealer should be rolled or sprayed on the pavement surface using a thick (3/8") paint roller and a handheld garden sprayer. Use coverage guidelines to determine a sufficient amount of material to provide an even, darkened coating. Roll or spray the material so it wets down and saturates all the pores on the surface of the paver. This is best achieved using a handheld garden sprayer and a thick paint roller to coat the surface of each paver, including the chamfers, edges and recessed areas on textured pavers. A second application may be necessary on more porous or older pavements to achieve a consistent and darkened effect. Care should be taken that no excess material is pooled on the surface or in the sand joints of the pavement. Material coverage will depend on the surface porosity and pavement usage. Airless sprayers can be used in lieu of hand held pump sprayers on larger projects. Use the largest nozzle to ensure SB-6000 Wet Look Sealer does not atomize and dry before it hits the pavement surface. The spray should be a low pressure, even mist to wet down the pavement surface. Clean all application equipment with water and do not allow material to dry in containers as removal becomes more difficult. 100-200 square feet depending on substrate porosity. I am looking for a wet look sealer for my concrete pool pavers. It is a salt water pool. Is this product suitable or will it make the tiles too slippery and will the salt eat through it? About 2 year and 4-5 days to ship. Approximately how long will this application last? How long does shipping take to oakland, ca.